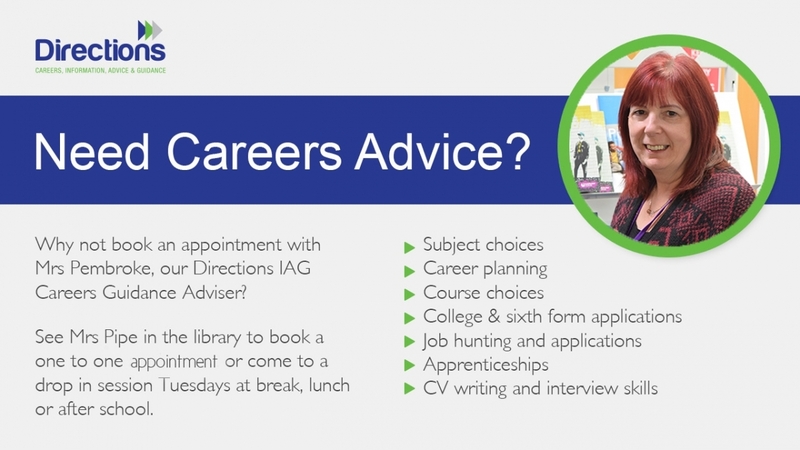 All students will have the opportunity to have at least one dedicated meeting with our Independent & Impartial Careers Adviser from Directions IAG Ltd, in order to help them make vital career choices. Break, lunch and after school drop-in sessions are also available. The Careers Adviser attends the schools’ Parents Evenings, Options Evening and GCSE Results Day in order to assist students and parents alike with any queries. The school has a dedicated careers area in the library where students can access all the information they will need in order to help them choose the correct career path, and careers education is embedded into the Learning for Life programme for all students. Work Experience is a fantastic opportunity for students to gain insight into the ‘real life’ working world and gives them a chance to develop their self-confidence, practical and communication skills, which will assist them as they progress into further education or permanent employment. We would encourage all students in years 10 and 11 to source a voluntary position during their school holidays. After leaving Alec Hunter Academy students have many Post-16 options including further education colleges, sixth forms and apprenticeships. Students are also able to receive help with applications and CV writing. In order to monitor and improve the careers guidance service we are giving in school, we would like all year 11 students who have had a careers guidance interview to click on the link below and complete the online survey - which will only take a few minutes. If anyone still requires any information, advice or guidance please make an appointment via Mrs. Pipe. Future First helps state schools and colleges to build alumni communities. Former students return as career and education role models, mentors and more. Alumini can be inspirational role models and help schools do even more for their students. That is why we help state schools and colleges to build alumini communities. Former students can transform a young person's confidence, motivation and skills. Click the button below to register.